Momentum-based investment strategies tend to thrive when the stock market has strong conviction regarding those stocks or sectors which are leading or lagging. This means that the leaders tend to remain the leaders over time (and vice versa), helping to establish a strong trend on which momentum strategies can build. In an earlier analysis ("Waiting on a Trend: Sector Leadership in the Current Market"), we showed that in 2016 there was a historically high level of inconsistency among sector leaders and laggards. That anomaly drove disappointing performance across a number of momentum trading strategies. Looking at this same phenomenon once again, but through the lens of single stocks, instead of sectors, we can see signs that the fundamentals that drive momentum-based strategies may be turning the corner. In our latest study, we analyzed the tendency for any single stock in the S&P 500® Index to remain in either the top or bottom performance quintile over consecutive periods. Intuition tells us that we should see some month-to-month carryover in those stocks that constitute the top and bottom quintiles, indicating a level of conviction among market participants regarding which investments are good ones and which are bad. Implicit in this view is that stock prices are driven by supply and demand, and that those in high demand should be market leaders. These steps produced a ranked and sorted list of all 500 stocks in the Index for each month in the time period examined (12/29/06-4/29/16). We then counted how many stocks stayed in the top or bottom quintiles over consecutive months. After calculating a 12-month average of these observations (in order to reduce some of the “noise” in the data set), we noted the results shown here. 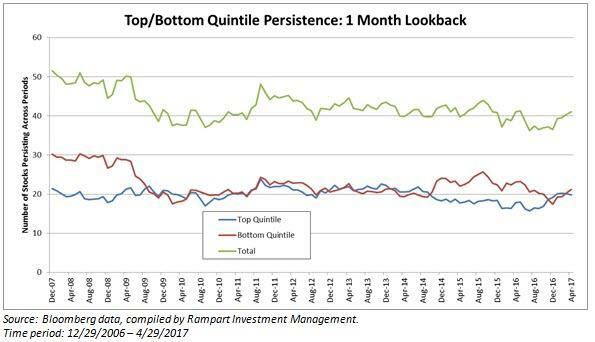 This analysis highlights one of the reasons for the weak performance in momentum strategies during 2016: weak quintile persistence. 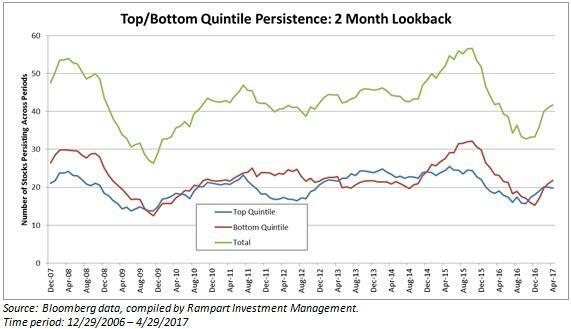 The total number of stocks “stuck” in either the top or bottom quintile (the green line) has been unusually low for the past year or longer. In fact, seven of the ten lowest readings over the past decade occurred in 2016. On the other hand, we also note a recovery to long-term average levels over the past few months. This behavior is also seen when we isolate the top quintile (blue line) and the bottom quintile (red line). To buttress our conclusions, we ran a similar analysis using slightly different parameters to see if the phenomenon persists. Using a delay—comparing current month quintiles to those observed two months prior—we observed the following pattern. From this viewpoint, the decline in market orderliness during 2016 is even more pronounced, as is the more recent recovery to more “normal” levels. This exercise serves to illustrate two points: First, the lack of persistence of market leaders and laggards that we saw in our sector analysis from last year is backed up by the single-stock data we examined. Second, we have observed a significant recovery in this metric over the past several months. The continued recovery of stock persistence going forward could be a positive indicator for momentum-based strategies in 2017 and beyond.